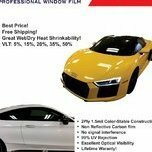 I have 2ply premium Carbon window film that has color stable for lifetime. It has a great wet/dry heat shrink ability and best price! 40 in rolls in 5 20 and 35 ? 2ply carbon based film and color stable for lifetime! 40" roll is only $109.95 and 20" roll is only $54.95 with Free Shipping. We have a good feedback on our carbon film from many tint shops. I have used this film multiple times and really do enjoy using it. The shrinking is awesome and totally love the color/looks just as good as my regular line of film I use. Definitely would recommend lexen for price and quality of products! Definitely will keep these on my shelves. What's up Shawn! All lurking around here I see. Need to grab lunch sometime.